As many as 13 persons including six children and a woman died and dozens others got critical injuries in various incidents of wall and roof collapse after windstorm, followed by torrential rain and hailstorm lashed various parts of Punjab. According to rescue sources, rain, thunderstorm and hailstorm with gusty winds hit different parts of Punjab, causing human and property losses. In Faisalabad, rain caused a roof to collapse claiming life of a woman identified as Shakeela Bibi while her husband got critically injured. Another life was lost in Burewala while four injured as a wall collapsed due to windstorm and downpour. In Sahiwal, three persons including two children died in various rain and wind-related incidents, which also left 22 persons critically injured. In Toba Tek Singh, heavy windstorm followed by torrential rain lashed the district while hailstorm was also reported at some isolated places. It caused the death of a farmer while several other persons were injured. 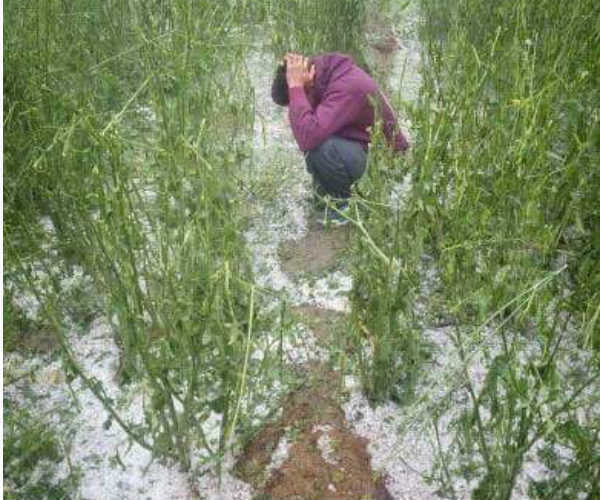 A farmer Faqeer Muhammad, 60, died after a big ice ball hit his head in Chak 360/GB, Rajana during hailstorm. Hundreds of trees were uprooted due to gusty winds as a result, different link roads were blocked for traffic while scores of electric pylons and transformers fell down due to which electricity supply to majority of the areas of the district was suspended. The electricity supply could not be restored in most of the areas despite passage of more than 20 hours when this report was being filed. Orchards having mango trees also badly affected due to windstorm and at least 30 percent fruit had fallen down from the mango trees. Water supply also remained suspended due to suspension of electricity in different localities while hundreds of graves in all graveyards of the district also collapsed due to torrential rain. On the other hand, windstorm claimed eight lives in different areas of Bahawalnagar district besides causing huge damage to property. According to police, residents and Rescue 1122, the dead included children and elderly persons. More than 120 persons sustained injuries in various incidents of wall and roof collapse in different areas. The rescue sources informed that Iqra Ramazan, 3; Saim, 2; Amina Bibi, 12; Siddique, 60; Jan Muhammad, 60; Shazia Bibi, 8; Shoaib, 12 and Zubaida, 7 died in different incidents during storm. The windstorm uprooted trees and signboards besides causing collapse of walls and roofs of many houses. The electricity pylons were also fallen, which left various localities in the darkness. According to Met Office, rain-thunderstorm with gusty winds occurred at isolated places in Lahore, Gujranwala, Bahawalpur, Bahawalnagar, Multan, Sahiwal, Okara, Pakpattan, Rahim Yar Khan, Sialkot and other districts of Punjab.